Since 2003, the mARTies have been the premier celebration of the arts – performing and visual, and the people who help make them alive in our community. It takes a mix of artists, philanthropists, volunteers and leaders to weaving together giving the community a more vibrant, rich and colorful texture. The mARTies are a signature event of the Arts Council of Martin County honoring outstanding artistic, voluntary and philanthropic achievement in Martin County which inspire a passion for and participation in the arts in our community. Funds raised at the mARTies support the on-going efforts of the Arts Council of Martin County to promote and support the vibrant arts community in Martin County. 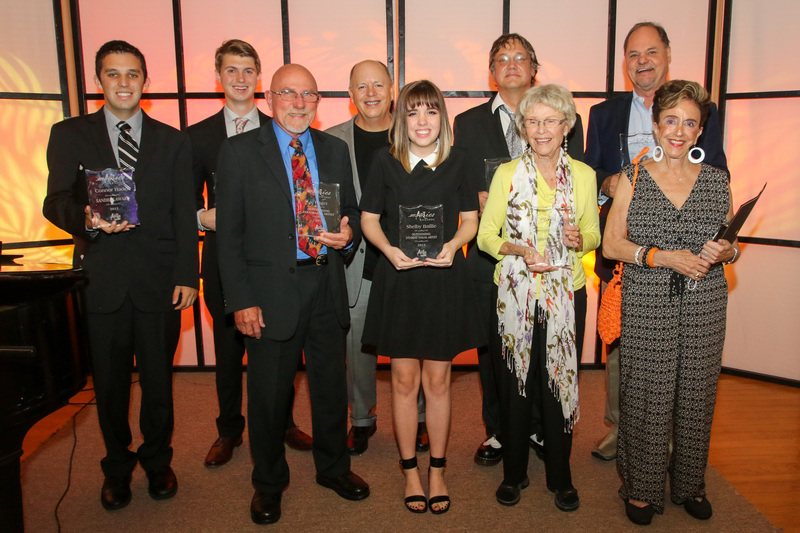 2015 mARTies Award Recipients: Connor Hadel, Sanders Award; Ryan Cox, Student Performing Arts; Al Hager, Performing Artist; Tom Servinsky, Arts Leadership; Shelby Baillie, Student Visual Artist; John Stiles, Excellence in Arts Education; Jane Miller, Lifetime Achievement Award; Dan Mackin, Visual Artist; Ethel Christin, Volunteer in the Arts. Award Winners Missing from photo –Wilmington Trust Company, Corporate Leadership and City of Stuart for the Water Birds Public Art Project, Special Recognition. What is a Named Award? Named Awards are an integral part of the mARTies Awards program. The categories were selected by the founding committee of the mARTies as a way to recognize key elements that make an arts community vibrant and sustainable. A short bio and photography of each named award recipient will be included in the program book and a representative of each nominee will be presented with an award during the evening’s program and be given a moment to say a few words. The named awards represent a legacy of commitment that has allowed the arts to be a part of the treasures this community has to offer its residents and visitors. And our Nominees Are… we also accept nominations from the community to recognize artists and student artists. The nominations represent a very important part of the arts community, and that is the artists themselves who are giving back, enriching the community through their creativity and expression of their talent, as well as the volunteers (many of whom have no artistic talents themselves) who believe in support the organizations who bring the arts to audiences across Martin County.